This section provides an overview of what selenium-webdriver is, and why a developer might want to use it. It should also mention any large subjects within selenium-webdriver, and link out to the related topics. Since the Documentation for selenium-webdriver is new, you may need to create initial versions of those related topics. In order to download chromedriver.exe . Finally, before being able to use WebDriver you will need to download the relevant language bindings, e.g. 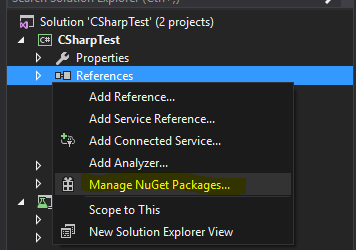 if using C# you can access the download from Selenium HQ Downloads page to obtain the required .dll files or, alternatively, download them as packages in Visual Studio via NuGet package manager. The required files should now be downloaded, for information on how to begin using WebDriver, refer to the other selenium-webdriver documentation. The easiest way of installing Selenium WebDriver is by using a NuGet package manager. Install "Selenium.WebDriver", and "Selenium.Support" (the Support package includes additional resources, such as Wait) by clicking on the Install button on the right side. In order to write tests using Selenium Webdriver and Java as programming language, you will need to download JAR files of Selenium Webdriver from the Selenium website. There are multiple ways to setup a Java project for the Selenium webdriver, one of the easiest from all of them is using Maven. Maven downloads the required Java bindings for Selenium webdriver including all the dependencies. The other way is to download the JAR files and import them into your project. Using command line, run below command into the project directory. Above command will download all the required dependencies and will add then into the project. Write below command to generate an eclipse project which you can import to the Eclipse IDE. Install the m2eclipse plugin by right clicking on your project and select Maven -> Enable Dependency Management. Create a new project in Eclipse following below steps. Download jar files from http://www.seleniumhq.org/download/. You need to download both Selenium Standalone Server and Selenium Client & WebDriver Language Bindings. Since this document is talking about Java so you need to download only jar from Java section. Have a look in attached screenshot. Note: Selenium Standalone Server is only required if want to use remote server to run the tests. Since this document is all above setting up the project so its better to have everything at place. The jars will get downloaded in zip file, unzip them. You should be able to see .jar directly. In eclipse, right click on the project which you created in step-1 and follow below steps. Similarly add the Selenium Standalone Server following the above step. Now you can start writing selenium code into your project. PS: Above documentation is based on selenium-3.0.0 beta version so the names of jar files specified may change with version. What is Selenium WebDriver ? Selenium is a set of tools designed to automate browsers. It is commonly used for web application tests across multiple platforms. There are a few tools available under the Selenium umbrella, such as Selenium WebDriver(ex-Selenium RC), Selenium IDE and Selenium Grid.